Imagine being on a tropical island, getting soaked up by the sun and the only thing you want to have is a cold, sweet, and delicious drink. Luckily if you travel to Indonesia you would easily find this in the form of Es Cendol, which is sold on pretty much every street corner at local food stands. But what actually is it and how is the best way to enjoy it? Cendol (pronounced as ‘Tjendol’) is originally from the Indonesian island of Java. If you travel to the West Java area, which is culturally dominated by the Sunda tribe, they call this drink Es Cendol, which literally means “Cendol Ice”. But, if you travel to Central Java and East Java, which is culturally dominated by the Javanese tribe, they call this drink Es Dawet. 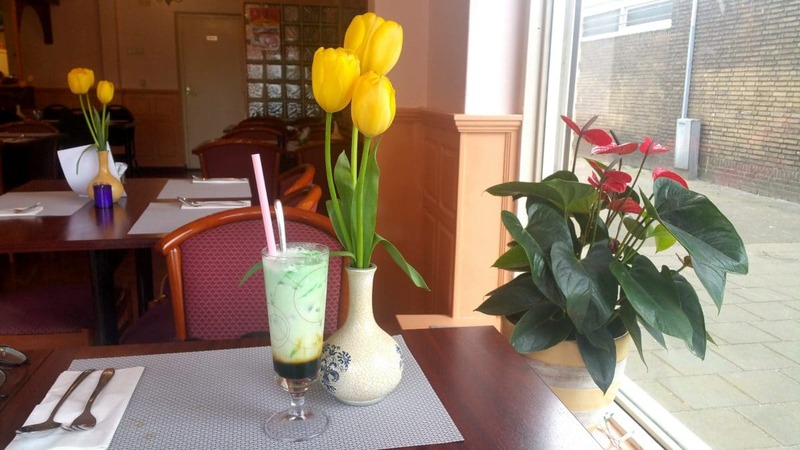 Sundanese people serve Es Cendol in a glass, while Javanese people often serve Es Dawet in a bowl. Cendol itself is actually the name of one of the ingredients which consists of a combination of rice flour and sago flour. They use Suji leaves and sometimes Pandan leaves to create the green color. Even though you will mostly see it with a green colour, sometimes you might find it in pink or in the original color, which is transparent. If you have a chance to see the seller serve the drink, you will see him pouring a fluid of palm sugar in the glass or bowl. After that he will pour a scoop of Cendol. Finally, he will pour in the coconut milk with ice cubes. Some of these sellers will also include a tiny cut of jackfruit as an ingredient, but some others only use jackfruit as an aroma mixed in the palm sugar liquid. The taste of Es Cendol is a combination of sweet from the palm sugar and savory from the coconut milk. Do you have a drink already in your sight? Here are some tips to enjoy it at its best. Firstly, don’t forget to ask for a spoon or straw from the seller. Stir your drink with your spoon or straw to make sure all the ingredients are well-mixed. You will know if your drink is well-mixed by seeing its color. If you still see the white and brown colors divided then you need to stir it more. Your drink will turn into a fair brown color if its well-mixed. If you forget to mix it you will only taste the savory part from the coconut milk and will end up with very sweet palm sugar liquid in the bottom of your glass/bowl. You can eat all of your Cendol with your spoon first before you use your straw to drink it. That helps to prevent your Cendol getting stuck in your straw or worse, stuck in your throat. Last but not least, enjoy your drink! 3 Responses to "How to Drink: Es Cendol"